Cyclic AMP-dependent protein kinase (PKA) plays a central role in regulation of energy metabolism. Upon stimulation of testicular Sertoli cells by follicle stimulating hormone (FSH), glycolysis is activated to increase the production of nutrients for the germ cells, and a new regulatory subunit of cAMP-dependent protein kinase, RIIβ, is induced. We have previously shown that production of the transcription factor C/EBPβ is rapidly increased by FSH and cAMP in primary Sertoli cell cultures, and that C/EBPβ induces the RIIβ promoter. In this work we show that USF1, USF2 and truncated USF isoforms bind to a conserved E-box in the RIIβ gene. Interestingly, overexpression of USF2, but not USF1, led to inhibition of both cAMP- and C/EBPβ-mediated induction of RIIβ. Furthermore, Western blots show that a novel USF1 isoform is induced by cAMP in Sertoli cells. These results indicate that the expression of various USF isoforms may be regulated by cAMP, and that the interplay between USF and C/EBPβ is important for cAMP-mediated regulation of RIIβ expression. The counteracting effects of USF2 and C/EBPβ observed on the RIIβ promoter is in accordance with the hypothesis that C/EBP and USF play opposite roles in regulation of glucose metabolism. Follicle stimulating hormone (FSH) regulates spermatogenesis through the somatic Sertoli cells of the testis . Sertoli cells act as "nursing" cells and supplies germ cells with energy and controls the biochemical environment in which they develop . Among the FSH-regulated functions are increased glucose uptake and oxidation. In response to glucose, transcription of several glycolytic and lipogenic genes are activated through the glucose/carbohydrate/insulin response element (GIRE, ChoRE or IRE) [3, 4]. Upstream stimulatory factors (USF) 1 and 2 are characterized by a basic/helix loop helix/leucine zipper domain responsible for dimerization and DNA binding, and are major components of the GIRE complex [5–8]. The main USF isoforms USF1 (43 kDa) and USF2 (44 kDa) are ubiquitously expressed and encoded by separate genes [9–11]. In addition, more isoforms of USF2 are produced due to alternative splicing and utilization of different translation start sites [12, 13]. USF factors exist as homo and heterodimers, and the heterodimer of USF1/USF2a seems to dominate, although there are cell-type specific variations . USF1 and USF2 show different transactivating potential, and USF2 appears to be the functional transactivator of the GIRE complex, although both USF1 and USF2 are important for sustained dietary-induced expression of the fatty acid synthase gene in liver . USF isoforms are important for expression of several genes involved in Sertoli cell growth and differentiation. Among genes that are stimulated by FSH/cAMP during the period of maturation of Sertoli cells (15 to 20 days of age in rats), are several subunits of cAMP-dependent protein kinase (PKA), the serine/threonine kinase mainly responsible for the downstream effects of FSH . Expression of the RIIβ regulatory subunit of cAMP-dependent protein kinase is highly induced (50-fold) at the mRNA level in primary cultures of rat Sertoli cells as a late response to cAMP peaking at 12 hours . We have demonstrated that expression of CAAT/Enhancer binding protein β (C/EBPβ) is induced by cAMP with rapid kinetics in Sertoli cells, and that C/EBPβ is responsible for induction of late response genes like the RIIβ-gene . The RIIβ promoter contains a conserved E-box/HLH element in the basal promoter localized at -280 to -275 relative to the functional ATG . This element is shown to be important for cAMP-responsiveness in granulosa cells, and it has been shown to bind both USF and Myc in CHO and NB2a cells [18, 19]. In this work, we show that USF isoforms may regulate cAMP responsiveness of the RIIβ promoter by modulating the effect of C/EBP, and that the formation of USF isoforms may be regulated by cAMP in Sertoli cells. A specific complex that formed a Dnase I footprint (-306 to -265) in the cAMP-responsive region of the RIIβ promoter in granulosa cells , covers a consensus E-box (CACGTG) known to bind helix-loop-helix (bHLH) transcription factors. Electrophoretic mobility shift assay (EMSA) with extracts from Sertoli cells demonstrated specific binding to the conserved element using the footprinted region as probe . When incubated with proteins from Sertoli cell nuclear extracts at least five complexes were formed (Fig. 1, complex I to V). We found that USF2 antibody shifted complex I and III (Fig. 1 lanes 3 and 4), whereas complex II and IV were completely shifted with USF1 antibody, suggesting that the USF complexes contained homodimers. Complex V was not shifted by antibodies directed against N-terminal parts of USF1 or USF2, but with antibodies directed against the C-terminal DNA-binding region of USF2 (Fig. 1 lane 3). Thus, this complex contained truncated USF2. A small shift in mobility of this complex was observed in extracts prepared from Sertoli cells treated with 8-CPT-cAMP for 6 h (data not shown). Experiments using various protease inhibitors indicated that the changes in complex mobility were due to inhibitory effects of PKA on the protease calpain. The truncated USF complexes forming complexes III to IV were abolished in the presence of calpain inhibitor I (ALLN) (unpublished results). USF isoforms bind to the RIIβ E-box. A [32P]-labelled oligonucleotide from the RIIβ promoter region (-305 to -268) was incubated with Sertoli cell nuclear extracts and subjected to EMSA. Supershift experiments were performed with 2 μl of antiserum against USF1 N-terminal region (lane 2), USF2a C-terminal sequences (lane 3), or USF2 N-terminal sequences (lane 4). In order to study the existence of different variants of USF expressed under stimulated and basal conditions, we performed immunoblotting experiments with antibodies against C-terminal regions of USF1 and USF2. For USF1, we observed that a new immunoreactive protein of about 31 kDa was formed only in nuclear extracts from cAMP-stimulated Sertoli cells (Fig. 2A). This isoform was not soluble, but associated with a 1% Triton extractable fraction (not shown). In contrast, we found no significant changes in USF2 protein levels or mobility following stimulation by cAMP (Fig. 2B). Other truncated USF1 or USF2 isoforms could not be detected in this assay, which may indicate that the levels of isoforms forming complex V (Fig. 1) are very low relative to the full-length protein. We were not able to relate the appearance of the novel 31 kDa USF1 isoform to changes in USF complex formation in EMSA. 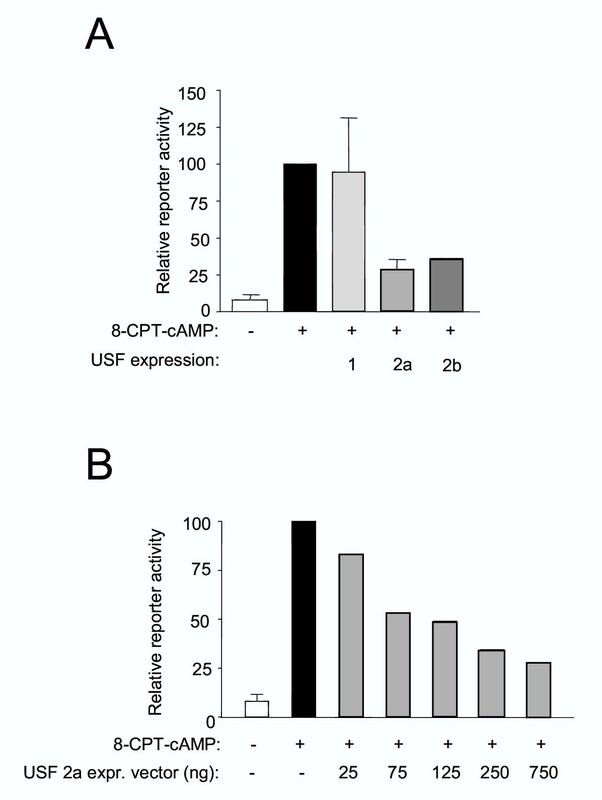 Formation of the truncated USF1 isoform in cAMP-treated cells was not affected by addition of calpain inhibitor (unpublished results). 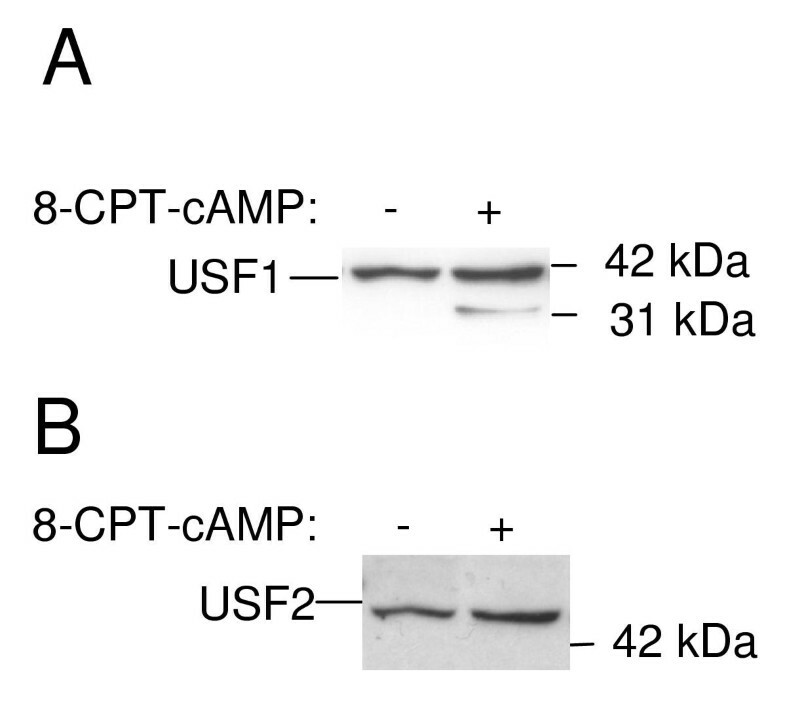 A novel USF1 isoform is induced by cAMP. Immunoblotting was performed with antibodies specific for the C-terminal regions of USF1 (Panel A) or USF2 (Panel B) on stimulated (+, 100 μM 8-CPT-cAMP, 28 h) or unstimulated (-) nuclear extracts. 20 μg of nuclear exracts was loaded in each lane, and equal loading was determined by coomassie staining. We investigated the function of USF isoforms in regulation of the RIIβ promoter, using a CAT reporter containing the basal RIIβ promoter including the consensus E-box (Fig. 3A) and expression vectors for USF1, USF2a and USF2b isoforms. We found that none of the USF isoforms affected basal transcription from the RIIβ promoter (not shown) whereas both splice variants of USF2 (a and b) reduced cAMP-stimulated levels of reporter expression to 25%. USF1, however, had no inhibitory effect on the cAMP-mediated induction of RIIβ. Fig. 3B shows a dose-dependent reduction of cAMP responsiveness with increasing amounts of USF2a expression vector with a 50% reduction in reporter activity at 75 ng of USF2a vector and a 75% inhibition at 750 ng of USF2a vector. USF 2A inhibits cAMP-mediated induction of RIIβ. A reporter construct containing the region (-395 to -123) from the RIIβ promoter was transfected into Sertoli cell primary cultures together with expression vectors for USF1, USF2a and USF2b isoforms or the corresponding empty expression vector. Empty expression vector was added to ensure a total of 2 μg of DNA transfected in each well. The cells were stimulated for 28 h with 100 μM of 8-CPT-cAMP (black and grey bars) or left untreated (open bars). Reporter activity is shown relative to the cAMP-stimulated level that is set to 100 (black bar). Data are normalized for expression of luciferase from the internal control plasmid. Panel A: Reporter expression levels in unstimulated (open bar) and stimulated cells in the absence (black bar) or presence of expression vectors for USF1 (1), USF2a (2a) or USF2b (2b)(grey bars). 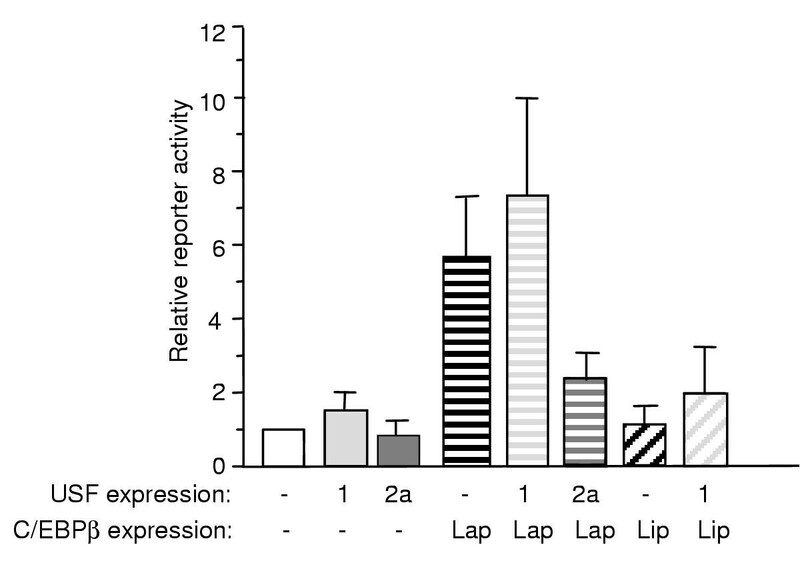 Panel B: Reporter levels in the absence (black bar) or presence of different concentrations of USF2a expression vector (0 to 750 ng, grey bars). Three separate transfections were performed in triplicate. We have previously reported that some of the late induction of RIIβ by cAMP depends on the rapid cAMP-mediated increase in C/EBPβ expression . To test the effect of different USF isoforms on C/EBPβ-mediated induction of the RIIβ promoter, we transfected combinations of the transcription factors (Fig. 4). As previously reported, the full-length LAP-form of C/EBPβ induced the RIIβ promoter 5–6-fold, whereas the C/EBPβ LIP-form lacking the transactivating region had no effect. Co-transfecting USF1 had no significant effect on C/EBPβ-mediated induction, but USF2a (1:1, USF2a:C/EBPβ expression vectors) reduced induction by 60%, indicating that USF2a may interrupt the ability of C/EBPβ to transactivate the RIIβ promoter. USF2 inhibits induction of the RIIβ promoter by C/EBP. The RIIβ promoter construct (-395 to -123) in the CAT reporter vector was co-transfected with 500 ng of expression vectors for USF1 (1), USF2a (2A) or C/EBPβ Lap (horisontally striped bars) or Lip (hached bars) isoforms or combinations of these factors. Empty expression vector was added to ensure a total of 2 μg of DNA transfected in each well. Data represent reporter activities (CAT/Luc) relative to transfection with the RIIβ promoter construct under unstimulated conditions, and were normalized for expression of luciferase from a cotransfected control vector (pGL3Control). Three separate transfections were performed in triplicate. The promoters of several genes induced by FSH in Sertoli cells and granulosa cells, including c-Fos, transferrin, follicle stimulating hormone receptor, SF-1 genes and the RIIβ gene, contain functional E-box elements [21–24]. We found that several USF complexes containing full-length USF1 and USF2 as well as truncated versions, are formed at the consensus E-box/HLH-binding element in the RIIβ promoter in Sertoli cell nuclear extracts. USF1 and USF2 display identical dimerization and DNA binding domains, but the transactivating regions differ . USF1 and USF2 obviously serve different, yet overlapping functions, and regulating the relative USF1/USF2 levels may be decisive for the pattern of USF-mediated gene expression, which has been shown in studies of USF knockout mice. The USF2 -/- mouse has obvious growth defects and reduced fertility , whereas the USF1-deficient mice are viable and fertile with minor behavioural disturbances. A severe delay in glucose-mediated regulation of the GIRE-containing fatty acid synthase (FAS) gene is found in both USF-deficient mice, although insulin response was unaltered, indicating that the USF1/USF2 heterodimer is implicated in FAS expression . We have previously shown that C/EBPβ functions as a secondary effector of cAMP signaling on slow response genes in Sertoli cells, including RIIβ . Both C/EBP and the RIIβ E-box is shown be involved in cAMP responsiveness of the RIIβ gene [17, 18]. Our present results indicate that USF2 disturbs this C/EBPβ-mediated transactivation of RIIβ. No consensus C/EBPβ binding site is found in the promoter construct responsive to cAMP and C/EBPβ, but a possibility exists that C/EBPβ attach to the RIIβ promoter through protein/protein interactions with USF1 or other members of the transcriptional unit formed at the E-box. C/EBP is previously reported to be an important accessory factor for transactivation by several other transcription factors . C/EBPβ was shown to transactivate the α1-acid glycoprotein gene promoter even when mutated in the DNA-binding domain, and this activation appeared to depend on protein-protein interaction with glucocorticoid receptor through the leucine zipper region . Recently, a conserved domain in C/EBPα and C/EBPβ was shown to mediate cAMP responsiveness, strengthening the fact that C/EBP may be characterized as a cAMP-responsive nuclear regulator [28, 29]. On the COX-2 promoter in granulosa cells, cAMP-mediated regulation was shown to be mediated primarily by an E-box that bind USF1 and USF2 isoforms in a manner resembling the RIIβ E-box in Sertoli cells . Transactivation of the COX-2 gene in skin carcinoma cells is highly dependent on this E-box together with a C/EBP binding site that bind C/EBPβ and C/EBPδ . These data strengthens a model of formation of a cAMP-responsive unit (CRU) containing USF and C/EBP. We propose a model of interaction between USF and C/EBPβ by which USF2 inhibits the cAMP responsiveness of C/EBPβ, either through interacting with the domain mediating the cAMP responsiveness or by competing with USF1. The cAMP-regulated formation of a 31-kDa USF1 isoform may also play a role in formation of the RIIβ CRU. This truncated USF1 isoform may result from proteolytic cleavage or may be a novel splice variant. In granulosa cells, it has previously been shown that the level of N-terminally truncated USF2 is regulated by cAMP. Binding of truncated USF2 to a HLH element in the prostaglandin G/H synthase 2 (PGHS-2) promoter was abolished in extracts from cells stimulated by human chorionic gonadotrophin (hCG) which signals through cAMP . Other reports have suggested a role for USF in inhibition of transcriptional activation mediated by other transcription factors. An inhibitory effect of USF on Myc-mediated cellular proliferation has been demonstrated in HeLa cells , and a non-canonical HLH element inhibits expression of the fibroblast growth factor binding protein (FGF-BP) in several carcinoma cells . Furthermore, USF2 inhibits binding of hypoxia-inducible factor-1 (HIF-1) to the plasminogen activator inhibitor -1 (PAI-1) gene in hepatocytes in order to disturb transcriptional activation . Our results add C/EBPβ-mediated activation of RIIβ to the mechanisms inhibited by USF. An opposite role of USF and C/EBP could also be explained by the counteracting effects these transcription factors have on glucose metabolism. Whereas USF induces expression of enzymes involved in glycolysis, C/EBPβ regulates gluconeogenesis mainly by activating phosphoenolpyruvate carboxykinase (PEPCK) [36, 37]. It has recently been reported that USF is implicated in transcriptional activation of the 1a promoter of the RIα gene in skeletal muscle cells . Regulating the relative levels of RIα versus RIIβ is physiologically important eg. in lipid metabolism [39, 40], and a possible function of USF in tuning RIα/RIIβ ratio by activating RIα transcription and inhibiting RIIβ transcription is an interesting target of further investigation. 1. USF1 and USF2, as well as truncated USF isoforms, bind to a consensus E-box in the RIIβ promoter in Sertoli cells. 2. Cyclic AMP induces expression of a novel 31-kDa USF1 isoform. 3. Overexpression of USF2, but not USF1, inhibits cAMP-mediated and C/EBPβ-mediated induction of the RIIβ promoter. USF antibodies specific for USF1 amino acids 83 to 157 (USF1N), USF2a amino acids 1 to 49 (USF2N) and USF2a/b amino acids 298 to 346 (USF2C) . Primary cultures of rat Sertoli cells were made from testes of 19 days old Sprague-Dawley rats (B&K Universal AS, Nittedal, Norway) according to the method of Dorrington et al. with some modifications . Culturing and transfections were performed as described elsewhere . Two days after transfections, the medium was changed, and incubation was continued in the presence or absence of 100 μM 8-(4-chlorophenyl)thio-cAMP (8-CPT-cAMP) (Sigma, St Louis, MO). Nuclear extract from Sertoli cells (12 × 106) were prepared by solubilization of nuclei in 0.4 M NaCl as described previously . Electrophoretic mobility shift assays (EMSAs) were performed using a double stranded [32P]-end-labeled oligonucleotide covering the consensus E-box/HLH element (underlined) and flanking sequences from the RIIβ promoter (-305, 5'-GATCGCCGGGTTGCCATGGTTT CCGGGGAT CACGTGGGCGCGCGG-3', -268). For each reaction, 5 × 103 cpm of labeled probe was incubated with 5 μg of crude nuclear proteins from Sertoli cells and 1.0 μg of poly dI:dC in a buffer containing 5 mM Hepes pH 7.9, 26 % glycerol, 0.2 mM EDTA, 0.5 mM DTT, 0.5 mM PMSF, 150 mM KCl and 5 mM MgCl at room temperature for 15 min. Supershift experiments were performed by incubation of nuclear extract/DNA with 2 μl USF antibodies for 30 min at 4°C. Samples were run in 6 % non-denaturing polyacrylamide gels at 120–150 V in Tris-glycine buffer (50 mM Tris pH 8.5, 380 mM glycine, 2 mM EDTA) for 3 to 5 h at 4°C. Subsequently, gels were dried and subjected to autoradiography. 20 μg of nuclear extract from Sertoli cell were loaded in 10% SDS PAGE gels and immunoblotting was performed as previously described . Equal loading was determined by coomassie staining. A reporter construct containing the basal promoter of the rat RIIβ 5'-flanking region (-394 to -123) upstream of a CAT-reporter gene (pCATbasic; Promega, Madison, WI) was used for assaying RIIβ promoter activity . Expression vectors for USF1, USF2a and USF2b inserted 3' of the CMV promoter in pCR™3 (Invitrogen, Groningen, The Netherlands) were used to overexpress USF isoforms . C/EBPβ LAP (full-length) and LIP (DNA-binding domain) expression vectors created in pCMV™3 (Stratagene, La Jolla, CA) were appreciated gifts from Dr. Shizua Akira (Hyogo College of Medicine, Hyogo, Japan). The luciferase expression vector pGL3 Control (0.25 μg) (Promega, Madison, WI) was used as an internal marker for transfection efficiency. After 2 days of culture in serum free medium, lipofectamine-mediated transfections of primary cultures of rat Sertoli cells were performed (2 μg DNA per well in 6-well plates) and assayed as described by Grønning et al . We thank Dr Benoit Viollet for providing us with USF antibodies and expression vectors, and Gladys Josefsen and Guri Opsahl for excellent technical assistance. This work was supported by the Norwegian Cancer Society, The Norwegian Research Council, Anders Jahres Foundation for the Promotion of Science and Novo Nordisk Foundation Comittee. Maria K. Dahle (author 1) performed the EMSA and expression experiments and drafted the manuscript. Kjetil Taskén (author 2) participated in the design and coordination of the study. Kristin A. Taskén (author 3) initialized, planned and coordinated the study, performed the immunoblotting and contributed to all experiments. All authors read and approved the final manuscript.